This chest consists of a walnut top with ivory and walnut line decoration leading down to the arrangement of drawers. Although the drawers have the appearance of seven drawers there are actually five: the top, third and fourth drawers all being long with two smaller drawers below the top drawer. 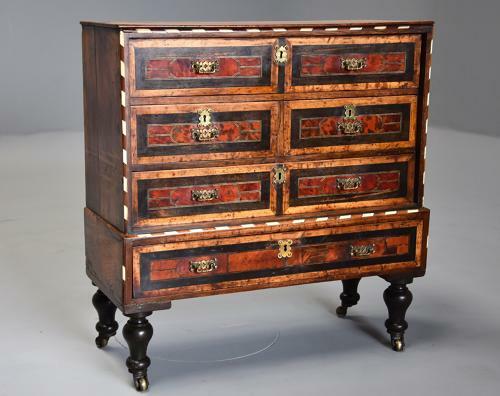 The drawers being highly decorative and consisting of fruitwood and ebony banding with central tortoiseshell panel with ebony and ivory line decoration, the sides being veneered with figured walnut. Originally the chest would probably have had wooden knob handles, the brass handles and escutcheons being a later addition dating from the Arts & Crafts period (1880-1910) - it is not uncommon for handles etc. to be replaced at some time due to changing fashions over the years. Originally the chest would probably have been supported by a stand but again changes have been made probably in the late 19th century where turned and ebonised legs and castors have been added. This chest is in excellent condition for age with some old repairs, it is of stable construction and can go straight into a home and is a very versatile piece.